Prym1 Camo is one of the newest supporters of The American Archer. Here's a little more info about their president, Stacie Walker. The American Archer: How did you first get involved in the outdoors? Stacie Walker: I am from south Louisiana. Being outdoors was a family affair. My dad started taking me hunting and fishing at age five. TAA: How did you come up with the Prym1 Camo design? SW: As a wildlife artist and a hunter, I saw the need for a non-traditional camo pattern. I used my knowledge of textures and shape as well as highlights and shadows taken from nature and wildlife to develop Prym1 Camo. I would ask myself, "why does a predator blend into its surroundings so well?" I wanted to design a pattern that would allow the hunter to move through his surroundings with the efficiency of a predator. TAA: What sort of experience would like your customers to have from using your product? SW: I want people to have a camo pattern that works in many terrains and situations. I want them to have freedom of movement and I want them to have a camo pattern that is attractive to look at. Because let's face it, camo is a lifestyle. TAA: How did you get connected with The American Archer and Outdoor America? SW: I am dear friends with Joe Thomas and have always been a fan of Tom Nelson. TAA: What type of hunting do you most enjoy? SW: I grew up duck hunting in south Louisiana and love whitetail deer hunting. But my absolute favorite is elk hunting out west. In fact, as I write this, I am sitting at elk camp in Mesa, Colorado. Tomorrow is the opening morning of the second rifle season. TAA: What's your most memorable hunt? SW: The first time I ever went elk hunting with my husband, Lance, in Chama, New Mexico. When I heard a bull bugle for the first time, the hair on my head stood up and tingled. It was awe-inspiring. Hunting such a magnificent animal was life changing. I was hooked. TAA: What's a dream hunt you'd like to do that you haven't yet had the opportunity to do? SW: My dream hunt is to go after a bull moose. The sheer size of them is amazing! TAA: Do you have any programs you're involved with to get more youth into the outdoors? SW: We are very active with youth. We sponsor "Hunters For Youth" and on the fishing side, we sponsor several state high school fishing programs. I appreciate the fact that my dad took me (a girl!) when I was young. I want other young people to have the same opportunity to enjoy the outdoors through hunting and fishing. TAA: What three things are you most passionate about? SW: First in my life is God. I am nothing without Him. Family is second. I am very close to my family and with my husband and two sons, hunting and fishing are a family affair. Third is Prym1 Camo. Being able to incorporate my love for art, wildlife, and hunting and fishing is a dream! Doug and his wife, Karen, are the founders and owners of Conquest Scents. Doug Roberts: My dad and uncles took me pheasant and deer hunting when I was just a boy and I was hooked. TAA: How did you come up with your products? DR: Our scent products, such as VS-1 and Evercalm, both happened by a God-given chance. It was by just working with the deer and paying attention to the smells that gave us the ideas. TAA: How did you develop your marketing approach? DR: We didn’t have money to hire anyone that knew what they were doing so we did it ourselves. TAA: What sort of experience would you like your customers to have from using your products? DR: We want our customers to experience our products giving them a more exciting and successful hunt each time they are in the woods. TAA: How did you get connected with Tom Nelson and The American Archer? DR: Wow! I met Tom Nelson when I was in college and he was selling bows. I bought a new Darton and that was in the early 80s. TAA: Do you have a favorite hunting story? DR: It is hard to pick a favorite out of my hunts. I would have to say my Texas buck. I had a chance at him right at the beginning of the sit and he just turned and left the field. I didn’t get an opportunity to shoot. An hour and a half later he walked back in front of me and I shot him at 38 yards. He scored 174 ½ inches! DR: My caribou hunt with my dad! We both walked 20 miles one day and never shot an animal but I got to spend time with him and see beautiful country with him! DR: Moose and mountain lion hunts. TAA: What programs are you a part of to get more youth hunters into the outdoors? DR: We work with the Flint SCI chapter on their wish hunt program. DR: God, family, and hunting. 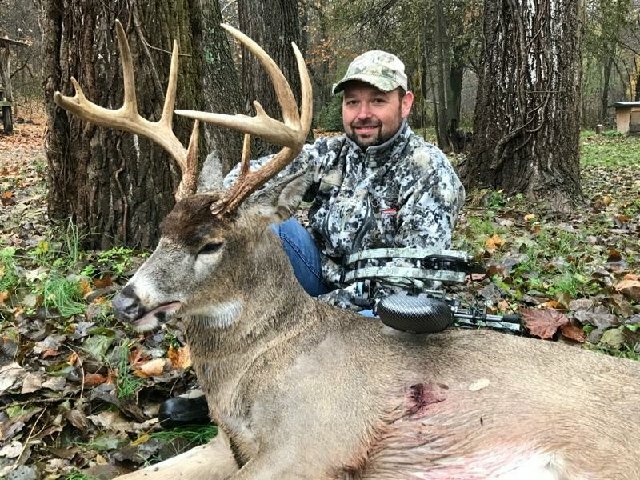 Congrats To Our Buddy, Kyle Null of New Breed Archery! New Breed Archery President Kyle Null recently tagged this buck. Congratulations, Kyle! Randy Kitts: As a kid, I always loved the outdoors. My uncles, Chuck and Jim, are who really got me into the outdoors. My dad died when I was young so my uncles filled that gap. TAA: How did Black Eagle Arrows come to be? RK: Like many businesses, I started mine from a bad venture and it turned into a great thing. I always knew that one day I would own my own business. RK: Pretty Simple. A GREAT product at a great price. We connect with our customers by being family-owned and -operated and we want people to feel like they are part of the family. RK: I got connected with Tom a while ago. I am not sure how but I am glad I did. He's a super good guy and well-respected. RK: One of my most memorable hunts was with my son, DJ. In 2016, I took him on his bear hunt-his first hunt with a bow actually. He did so well and the Lord blessed us with a great bear, hundreds of northern pike, and memories that will last forever. Oh, and I ran into Tom Nelson in an airport while I was traveling! RK: We manufacture S3DA arrows and we helped the kids where we can in regards to tournament and many hunters too. It is the future of our sport and I think we do a great job helping the kids. 2. My relationship with God. 3. Integrity. A man's word is his bond and I believe you should always do what you say you are going to do.